The euro reversed its losses today and rallied by 0.5% against the US dollar. The turnaround came after a disappointing set of inflation figures from the US. Core inflation was static with an annual rate of 1.8% in July. This was in line with most expectations. The price of a basket of goods (including the food and energy category) however dipped to 0.1% in July according to data from the US Department of Labor. Markets had forecast a slightly faster pace of price rises – the consensus was for a 0.2% increase. 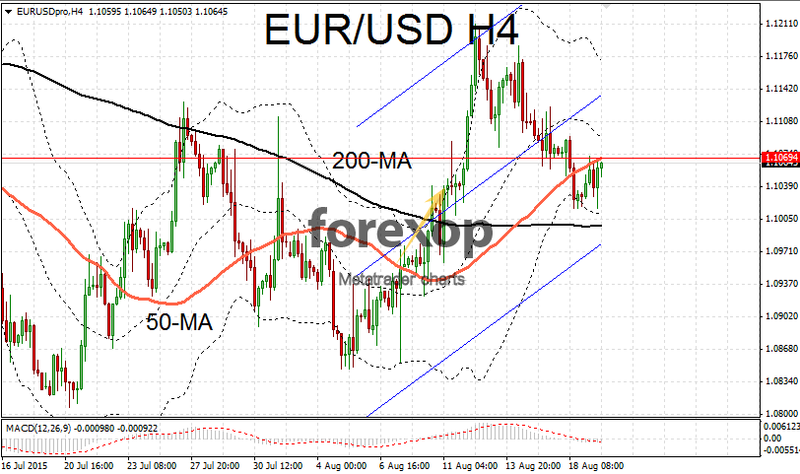 After dipping as low as 1.1016 EUR/USD retraced its downward trajectory and moved back up to the upper end of the 1.10 range. 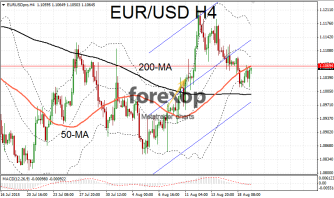 EUR/USD was encountering heavy resistance around the 1.1069 level – this kept the pair trading below the 50-point moving average on the four hour chart. Traders were reluctant to place large bets ahead of the release of the FOMC’s minutes which are due for release later this evening. The euro received an additional boost in sentiment after it was reported that the German parliament approved a third bailout deal for Greece. Credit rating agency Fitch also upgraded Greece’s credit score. Fitch cited the current bailout agreement as reducing the risk that the country will default. Greece’s long term credit rating was raised to CCC from CC. The US dollar was trading lower against the yen for a second day. The main uncertainty was centered around the FOMC minutes – and how events in China could influence the timing of the long awaited US interest rate rises. Chinese equities rebounded slightly after yesterday’s 6% selloff but sentiment remains extremely fragile. USD/JPY was trading down to 124.05 as investors were drawn to the relative safe haven status of the Japanese currency. Trade figures released yesterday added support to the yen. Japanese exports grew far more strongly than expected according to recent data. Year on year, exports grew by 7.6%. The fall in imports was also lower than expected at minus 3.2%. The euro was trading flat against the yen at 137.19. This was well below the peak of 138. 5 reached last week. The yen gained an additional boost after the price of crude oil fell.